Pique assiette – or picassiette ( a french term -“stolen from plate”) – pieces of broken pottery, china, glass, buttons, figurines, and/ jewelry are cemented onto a base to create a new surface. Almost any form can be used as a base, and any combination of pieces can be applied, restricted only by the individual creator’s imagination. Using broken china and your own found and cherished objects. This is a great way to re-purpose heirloom chipped china. All materials and tools will be provided. However, you are encouraged to bring in materials for your projects such as ceramics (i.e. dishes to be broken), stone, shells, found objects, etc. 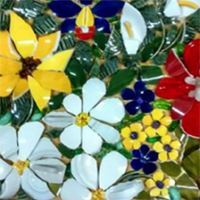 You will create a 12 inch x 12 inch piece, and leave with the skills to create mosaics on your own. We will learn how to prepare the surface, learn basic nipping/cutting techniques. Some moderate hand strength needed.